For other places with the same name, see Norbury (disambiguation). Norbury is a district in south-west London. It shares the postcode London SW16 with neighbouring districts Streatham and Croydon. Norbury is 6.7 miles (10.8 km) south of Charing Cross. The name Norbury derives from North Burh, (North Borough). Some local histories note that this was due to Norbury's position on the northern boundary of the former Manor of Croydon. 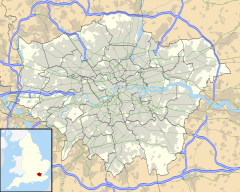 In fact, it takes its name from a split in the borough of Bensham, one of the former seven boroughs of Croydon. "Northbenchesham" became the Northborough, then Norbury; "Southbenchesham" later became Thornton Heath. Norbury, like Streatham and Croydon, lies on the London to Brighton Way Roman road, the northern part of which has become the A23 road. At Hepworth Road, the intact road, 32 feet wide, was excavated in 1961. Remnants of a metalled ford across the stream were found further south at Hermitage Bridge on the River Graveney which forms part of the boundary between Norbury and Streatham, before flowing on to the River Wandle, then the River Thames. Norbury was a sub-manor of Croydon Manor and was held by the Carew family between 1385 and 1859. The Carews also held Beddington. Norbury Farm was the manor house: it was demolished in 1914. Norbury Hall, Craignish Avenue, does remain, now as a retirement home and a Grade II listed building. It was built for William Coles in 1802. In the late 19th century, its owner was James Hobbs, local businessman and fifth Mayor of Croydon who bought the house in 1884. A few years later, he was implicated in the Liberator Building Society scandal with Jabez Balfour, convicted and imprisoned. The Hobbs family owned the Hall until 1958 when it was sold to the County Borough of Croydon (from 1965 the London Borough of Croydon), with its gardens open to the public. By then most of the farms and open land belonging to Norbury Manor and Hall had been built upon. The London County Council built an estate of almost 500 homes in Norbury, one of its first 'Out-County' estates between 1906 and 1910. Norbury railway station opened in 1878, although the railway line had opened in 1862. It was rebuilt in 1902 and connects Norbury with East Croydon, London Bridge and London Victoria. Although Croydon's horse-tram network never reached Norbury, electric trams were introduced in 1901, connecting the town all the way through to Purley. However, Croydon trams and London trams used different systems and could not use the same tracks, leading through passengers to have to change in Norbury. This was finally rectified in 1925. The trams were removed after World War II but there are plans to extend Tramlink from Croydon to Streatham via Norbury. Like other districts of northern Croydon, Norbury has significant foreign communities. The 2011 census showed that White British was the largest ethnic group at 24% of the population, followed by 13% Black Caribbean, 12% Indian and 12% Other White. Norbury is portrayed in a Sherlock Holmes short story, "The Adventure of the Yellow Face", as one of the few places in which the detective turned out to be wrong regarding his theories (as referenced in the episode "The Six Thatchers" of the BBC-Series "Sherlock"). ^ "Croydon Ward population". Neighbourhood Statistics. Office for National Statistics. Retrieved 10 October 2016. ^ I. D. Margary (1965). Roman Ways in the Weald. Phoenix House. This page was last edited on 24 February 2019, at 03:23 (UTC).